Under ‘Digital India’ mission, Indian Government has made nation’s first and largest multilingual dictionary, access to which is entirely online. Named as BharatVani.in, this dictionary can right now decipher words from 22 different languages, and is and in the coming days, Government plans to include100 more languages into the platform. 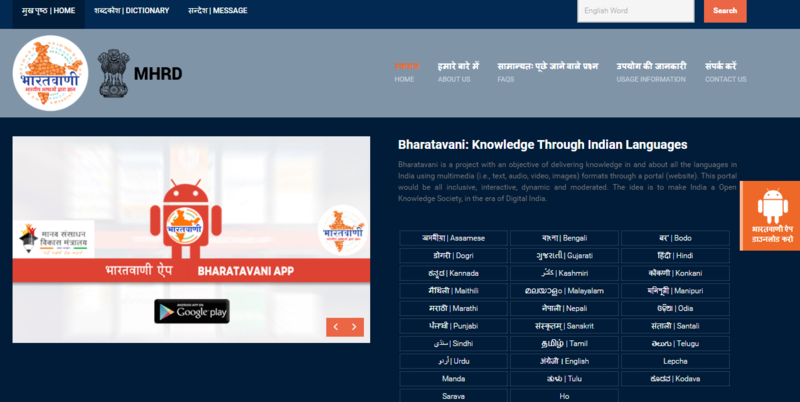 The app was launched by Union HRD Minister, Smt Smriti Irani at Lucknow, wherein she said that BharatVani has been launched under PM Modi’s Digital India mission, and it will help to showcase the tradition and culture of India to the outside world; and it has the potential to bring in a vernacular revolution inside the country. “More than 40 crore Indians use Hindi language to communicate. They read and write in Hindi. Unfortunately, less than 1% content is available in Indian languages in cyberspace,” said Smt Smriti Irani. “It is the largest Internet language site in the world which will facilitate online cross-lingual learning courses enabling people to learn any language,” she added. This aspiring multilingual dictionary project is being executed by The Central Institute of Indian Languages (CIIL). This first initiative of Indian Govt. to encapsulate regional languages will help Indian technology companies to integrate regional languages into their products and creations. Govt. has also launched an app of this dictionary, which can be downloaded from Google Playstore. Right now, this app is being supported by 35 multilingual dictionaries, which would be expanded to 250 dictionaries in the coming days. The portal aims for ‘Digital Kranti’ (revolution) in government’s Digital India mission.